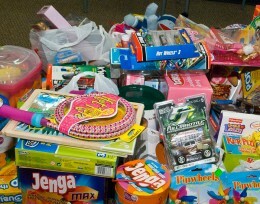 Wright State faculty and staff donated nearly $1,500 in toys and monetary donations in 2010. If you’re at Wright State University during this intersession, you may have noticed the colorfully wrapped barrels that have been appearing around the Dayton campus. These festive receptacles are collection bins for the annual Christmas for Kids toy drive. Every year, Wright State works with Montgomery and Greene County Children Services to collect donations of gifts for families in need in the Dayton area. Montgomery County Children Services asks donors to provide general gifts, which will be used to stock the Toy Cottage, where parents and foster parents can choose items for their children. The Toy Cottage is managed by FLOC (For Love of Children), an industry of volunteers who are passionate about caring for neglected, abused and foster care children in our community. Greene County Children Services keeps a list from which donors can pick a child or family to “adopt.” Donors will receive wish lists from their adoptees. If you’re interested in providing gifts to children in Montgomery County, contact Annette McCoy at (937) 775-5022 for donation information. Items can be dropped off in the donation barrels in 013 Dunbar Library, 106 Allyn Hall, 115 Medical Sciences, or 160 University Hall by Friday, Dec. 9. McCoy can also help donors adopt a child or family from Greene County. Gifts for these families must be dropped off by Thursday, Dec. 15, in 013 Dunbar Library.